When I was in college many of my friends went to 'Taco Tuesday' night at a local establishment. The building was clearly run down and the inside, if memory serves correctly from my one and only time walking through the doors, was dark with that strange misty look in the dim lights from stale cigarette smoke. Taco Tuesdays meant cheap food, cheap pitchers, and probably a lot of fun that my goodie-two-shoes missed out on. In order to add some variety to our weeknight meals, I've decided to reinstate Taco Tuesdays. Obviously without the stale cigarette smoke, dimly lit bar and pitchers of beer. What we will have- must have- are delicious tacos. The first round will feature these slow-cooker shredded chicken tacos topped with fresh, green cilantro, creamy guacamole, and crumbled queso fresco. The chicken simmers with some IPA and...wait for it...ENCHILADA SAUCE...in the crock-pot until tender and infused with flavor. And who knows where we will go from there. The possibilities for Taco Tuesdays are endless! Why enchilada sauce, you ask? Because I almost always have a stash of the stuff in my pantry. Because it is delicious. Because it saves me on busy nights when I just can't fathom finding the energy to put any more effort into dinner. I have to say that this was one of the more delicious meals we've had in a while. The past couple weeks have been so jam-packed with craziness that we've been living on left-overs, eggs, and rice. It's not all bad. Not at all. But sometimes you need a real meal. Right? Right. I recommend Frontera enchilada sauce for this recipe. It has a readable list of ingredients and the depth of flavor is really nice. For the beer, any light brew will do. I used IPA but you can use whatever you have on hand as long as it isn't dark like a stout. Put the chicken thighs in a slow cooker and top with the enchilada sauce and the beer. Half an hour before the chicken is done cooking, use two forks to shred the meat. Cover and finish cooking in the slow cooker. Wrap the tortillas well in foil and place in a 350 degree oven. Heat until warmed through, about 10 minutes. Serve with the garnishes in bowls on the table. 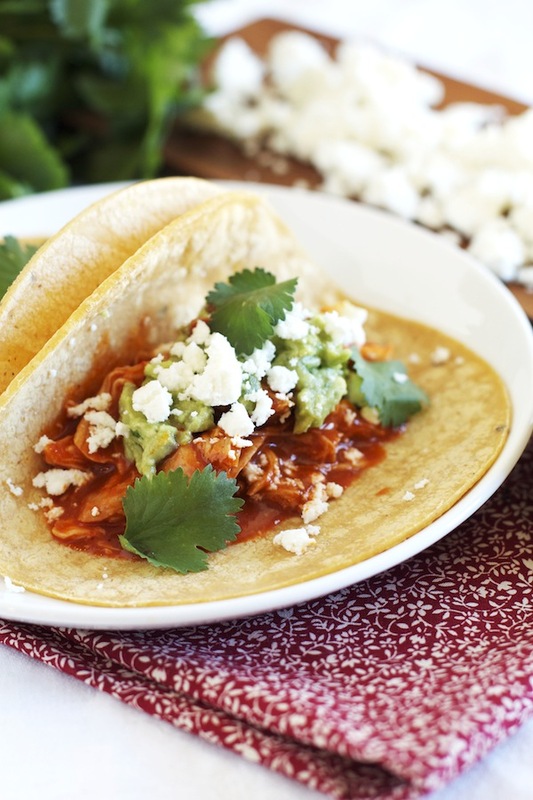 To assemble, place some chicken in a tortilla, top with guacamole, queso fresco, and cilantro. Drizzle with lime juice.